Lynton is a townsite in the Mid West region of Western Australia. It is part of a larger rural district known as Yallabatharra. Lynton is situated at the mouth of the Hutt River, 7.6 kilometres (4.7 miles) by road from Gregory – between the larger towns of Northampton and Kalbarri. Lynton is best known as the site of the former Lynton Convict Hiring Depot. On 22 May 1853, the Port Gregory Convict Depot (known later as Lynton Convict Hiring Depot) was built to supply convict labour to the Geraldine lead mine, in the bed of the nearby Murchison River. The supervisor of the depot, Captain H. A. Sanford, had a residence constructed in the area during 1853 and named it Lynton. The reason for Sandford's use of the name is unknown, although it was "the name of his parent's village in Surrey". The name of Lynton was soon being applied to the broader area around the depot. Anna Harriette Leonowens, later famous as the author of Anna and the King of Siam, lived in Lynton during the mid-1850s, while her husband, Thomas Leonowens, worked there for the Commissariat. Their son, Louis was born at Lynton in 1856. The convict hiring depot was moved to Champion Bay (Geraldton) in 1857. Lynton townsite was not officially gazetted until 1854. The adjoining townsite of Pakington (later renamed Gregory), was gazetted around the same time. ^ a b Gibbs, Martin (2007). "Lynton: convicts, landscape and colonisation strategies in midwest Western Australia" (PDF). Australasian Historical Archaeology. 25: 57–69. Retrieved 21 September 2018. 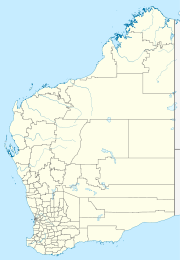 ^ a b Western Australian Land Information Authority. "History of country town names – L". Retrieved 21 September 2018. ^ "Statistical Geography Boundaries". Australian Bureau of Statistics (ABS). 2018. Retrieved 22 September 2018. ^ Habbegger, Alfred and Foley, Gerard. Anna and Thomas Leonowens in Western Australia, 1853–1857, State Records Office of Western Australia, March 2010. ^ Louis Thomas Leonowens' birth was officially registered at Port Gregory as Lynton had not yet been gazetted (Register of Births, Western Australia, 1856, no. 3469). His mother gave her name as "Harriet Leonowens", née Edwards. This page was last edited on 22 September 2018, at 01:12 (UTC).